Defying every convention of traditional design, the new Sandals Grenada takes innovation beyond the realm of imagination to create an extraordinary resort unlike anything you have ever experienced. Pools in the sky and living rooms in swimming pools. Private plunge pools, cascading waterfalls and meandering river pools. Here, in the heart of Grenada's exclusive Pink Gin Beach, on an exotic island paradise where the intoxicating scents of spice and tropical blooms make a heady elixir for romance, we've taken the best of everything to create a whole new Sandals experience... one that takes you beyond the unexpected. 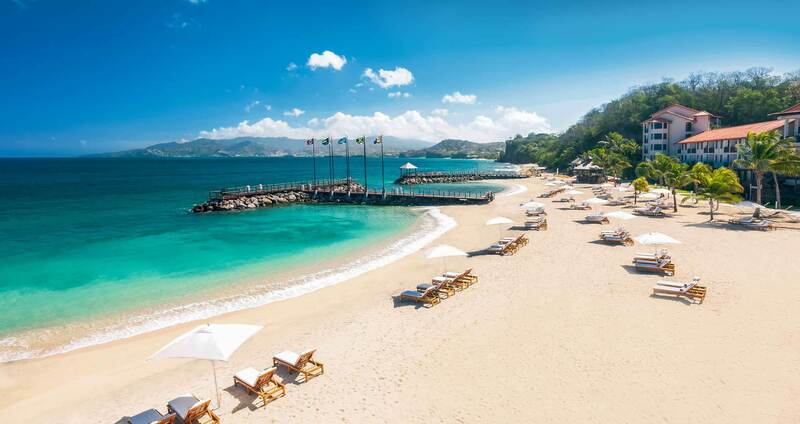 Known as the "Island of Spice" Grenada is a truly exotic paradise, one that just happens to be the perfect landscape for a Sandals Resort. This "Island of Spice" is known for its remarkable natural beauty, pristine beaches, impossibly blue seas, and a veritable treasure trove of spices - cinnamon, ginger, cloves, and particularly nutmeg, its most sought-after spice. From suites featuring pools in the sky to exotic Rondoval suites-in-the-round to Swim-up Suites with Tranquility Soaking Tubs™, our rooms and suites offer the very best in innovation and unique amenities, including infinity-edge plunge pools on oversized balconies, spa-style bathrooms and Butler Elite service. The culinary experience at Sandals Grenada is unrivaled in the Caribbean, celebrating epicurean treasures from the streets of Rome to the delectable bounty of the sea to Sandals first true steakhouse. Our exclusive partnership with Robert Mondavi Twin Oaks® Wines raises the standard of the “included” wines poured at our all-inclusive luxury resorts. We also provide an amazing selection of wines for sale on our Manager’s and Chairman’s lists. We have designed the bars exactly where they should be—right on the beach and directly over the ocean—to give you a truly authentic island experience. Grown in Jamaica's misty Blue Mountain range, Jamaica Blue Mountain's coffee possesses an unmatched superior flavor and it's included throughout all our specialty restaurants, French-style cafés, Lounges, self-serve coffee stations, and indulging room service. From chic gatherings to exciting shows, no one throws a party like Sandals because here every night is a celebration. Scuba diving at Sandals truly offers you the very best in equipment, staff and unbelievable dive sites — all included! From regulators, BCD's, masks, snorkels, fins and tanks to state-of-the-art, twin diesel Newton boats and expert guidance from our PADI® certified dive professionals — we've taken care of everything. Sail away and indulge in a vast array of all-inclusive water sports. With our top–of–the–line equipment, professional staff and unparalleled tropical locations, you can choose to fly across the water – propelled by wind, motor or muscle-power – or dive beneath its pristine surface. Tennis, day and night, on lighted courts surrounded by fragrant tropical flowers and cool breezes that flow through towering trees. Croquet on emerald–colored manicured lawns. Volleyball on pillow–soft sand. At Sandals, there are no limits to what you can play. Pool areas have been completely reimagined to take full advantage of the island's sultry, tropical landscape, and nowhere is that more apparent than at the resort's ocean-side pool. By day, the view is simply astonishing, with the infinity-edged pool blending seamlessly into the horizon. Come nightfall, chic fire pits and fire features transform the pool into a sizzling outdoor lounge. The Luxury Included® Experience begins at Club Sandals, a place overflowing with extraordinary privileges, unique experiences, and exceptional service for concierge guests of Sandals Resorts. Genuine hospitality is completely redefined, allowing guests to enjoy one-on-one service and complete relaxation in the comfort of a stylish lounge. At Sandals, all gratuities are included. From bellhops to waiters to bartenders, all tips are taken care of. In fact, only personal butlers are allowed to receive tips. Enjoy Sandals Resorts industry-leading hospitality and personalized service, and leave your wallet at home. A Sandals all-inclusive destination wedding takes the worry out of planning, giving you more time to enjoy the moment. Best of all, even your wedding is included! From the moment you arrive we start taking care of you. Relax and enjoy your stress-free ride with non-stop airport resort transfers featuring air-conditioning and comfortable, spacious seating. Or, opt to arrive in style in a private luxury vehicle from our first class fleet, which is available for an additional cost. Classic European rituals are reinterpreted with a distinctive Caribbean flair at the exclusive Red Lane® Spa at Sandals Grenada. You'll find a unique sense of tranquility with a selection of exclusive services infused with botanical products, transforming your quest for inner beauty into a journey of endless self-discovery. Island Routes offers luxury adventure tours that range from completely exhilarating to delightfully sedate. No matter what your speed, you'll gain insider insights and a whole new perspective on this beautiful paradise that we call home. Luxury Like You’ve Never Experienced Before. Romance soars to new heights in our SkyPool Suites. Open your bedroom doors to reveal an infinity-edge plunge pool that seamlessly blends with the distant horizon. 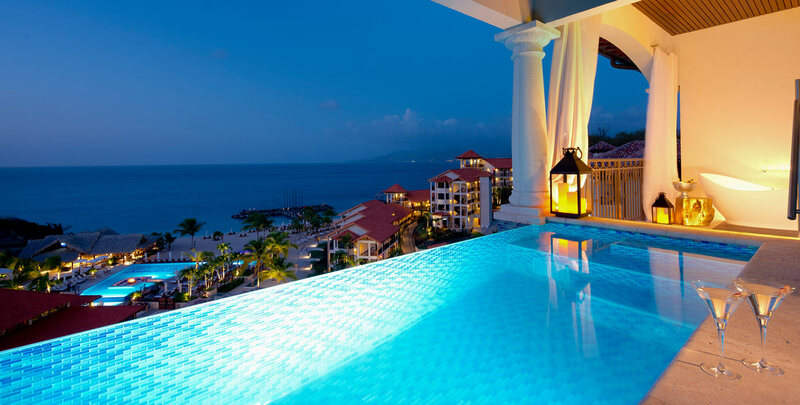 The culinary experience at Sandals Grenada is unlike anything else you'll find in the Caribbean. Savor an epicurean adventure that takes you from the passionate palate of Rome and the sophistication of France, to the delectable bounty of the sea and the Caribbean's first true steakhouse. Whether you crave an evening of fine dining, the casual atmosphere of a brick oven pizzeria, a playful pâtisserie or a lively Teppanyaki table, ten thoroughly unique venues offer the cuisine and ambience certain to suit every mood and whim. For inclusive offer, the $1,000, $775, $505 & $375 Instant Credits are in USD, applied to the base fare and excludes government taxes and fees, which must be paid at time of booking and is fully non-refundable. Offers are subject to availability throughout promotional period. Other restrictions and limitations may apply. Receive FIRST NIGHT FREE when you book 7-nights and pay a min. of 6-nights at this resort in select room categories. Blackout dates: Dec. 27 - 31, 2018 | Dec. 27 - 31, 2019. Offers may not be applicable for group bookings.